The Red Emperor scarf seems to be on hiatus. 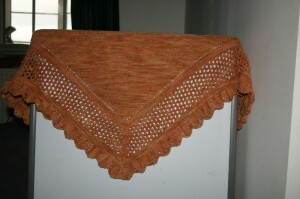 I was surprised by the way in which the Aestlight Shawl grabbed my attention. I completed Light and Crusty in 3 days. It is currently blocking and an FO post follows soon. Brace yourselves, though – there are now two more Aestlights on the needles! Yes, it certainly has caught my imagination. Aestlight #2 is in the prize-winning homespun Shetland Tweed. I have a rudimentary idea of spinning some dyed Shetland for the lace border section, so it may take a wee while to come to fruition. Overall, I am completely inspired by the notion of bi- or multi-coloured Aestlights and spent some time today in sorting through my stash, pairing up balls of yarn. 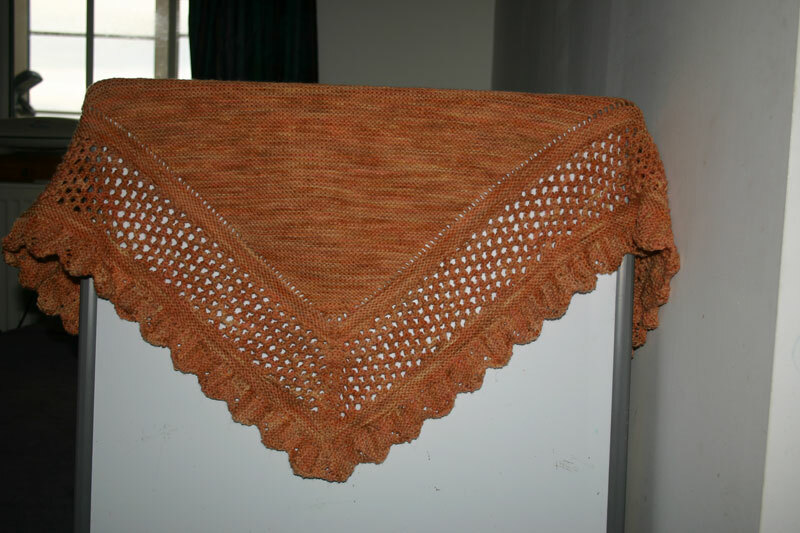 I have several… a large “several” sets of colours bagged up against the day that I need some “idiot knitting.” The foundation garter stitch triangle is the most perfect boat knitting. I can grab a bag at any time that I am heading in the direction of the ferry. As the triangle is suspended on spare yarn on completion, it then frees up the needles for the next one… Indeed, one return trip to Kirkwall may well furnish two foundation triangles in the smaller size. Aestlight #3 will see light of day before #2. I cast it on while I was cooking lunch today and it is growing rapidly. I’m using the Kingcraig lambswool/silk 4ply, which I have in 2 colours. The base will be grey and the contrast will be turquoise. Can’t wait to see how that turns out! …which I may well be able to do soon, as some work came my way today. I need to put a quote together soon. Lovely surprise. I may well do the job on a barter basis, in which case some home improvements will be done sooner than expected and I shall hope that Mr L goes some way to rewarding me with a few little items that I have been longing for. Like blocking wires. And Signature needles. Today’s other surprise arrived on a fork lift truck. Carefully transported from the haulier’s yard (thankfully only about 1/4 mile away) on the forks, was Mr L’s new mowing machine. It came all the way from Buckinghamshire, via Shetland, and arrived unscathed. And it’s p*ss*ng it down today so no fun and games testing it out on the Windswept Acre today. What a shame. I may just have to knit some garter stitch to salve my grief. I think I should also put in a repeat or two on the Emperor, he must be feeling neglected.